After work on Friday we stuffed our climbing gear into Jeremy’s truck, and headed out of Denver. The climb immediately presented it’s first obstacle in the form of a traffic jam. 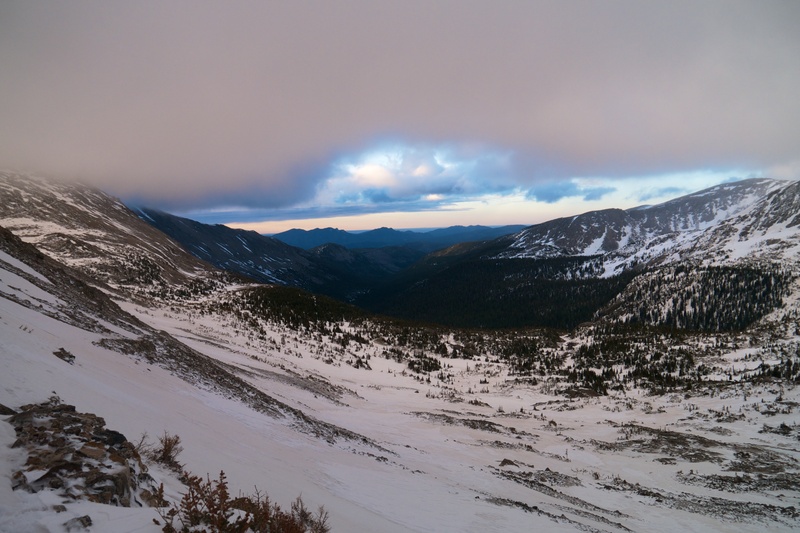 We neared the “4th of July” trail head as dusk approached. Suddenly I spotted a cow moose in the bushes, apparently they are becoming quite common in this area. We arrived at the trailhead to find the campground closed. I was planning on sleeping in a tent, however, the frozen ground would not accept a tent stake, and with 40MPH gusts predicted; I opted for some man cuddling in the back of Jeremy’s truck. Dayton showed up just as we were about to head for bed. We decided on a 3:45 start time, and crawled into our trucks to catch some rest. Several blasts of wind rocked the truck hard, which made me glad I wasn’t in a tent, and also made me dread leaving my sleeping bag. 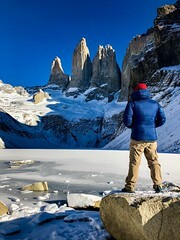 All to soon we were up and cramming our feet into mountaineering boots, and shouldering packs. 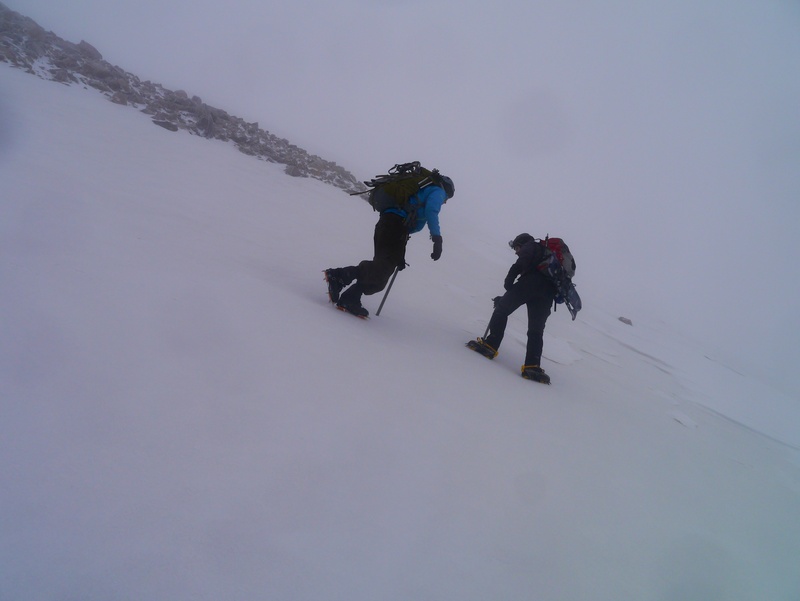 We hit hard packed snow almost immediately after leaving the trailhead. 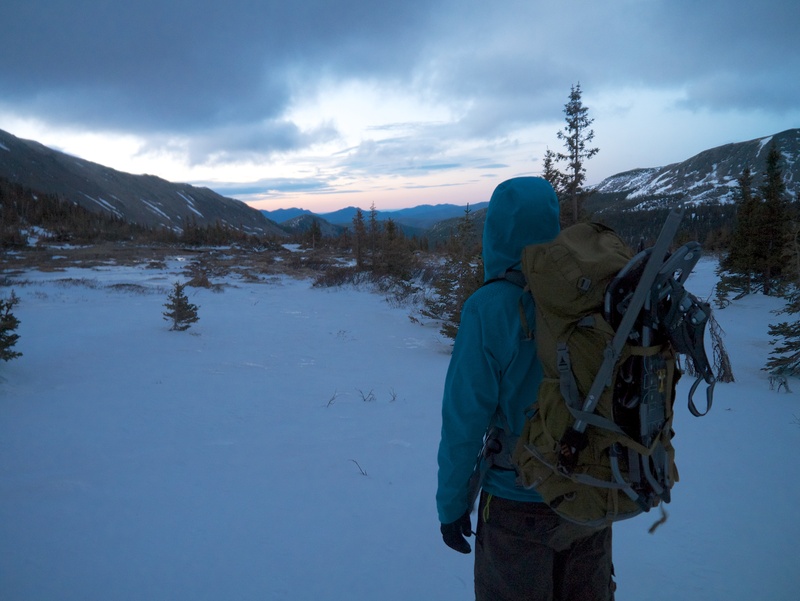 Thankfully snowshoes were not needed, but the snow did make route-finding in the dark a bit challenging. 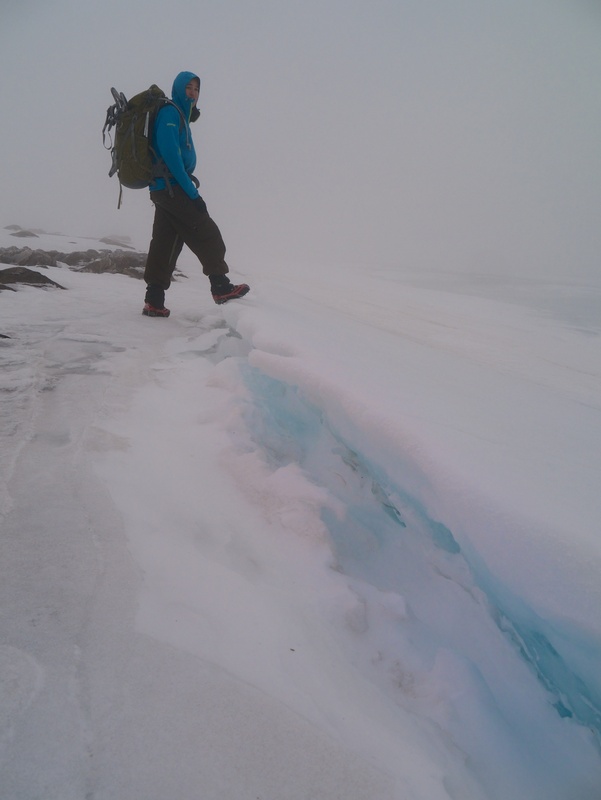 The approach included several miles of traversing 30-40 degree hard packed snow. Not difficult, but lots of care was required. The wind persisted even after dawn. A strong wind combined with temps in the 20’s made us chilly. However, we knew it would keep the snow firm. 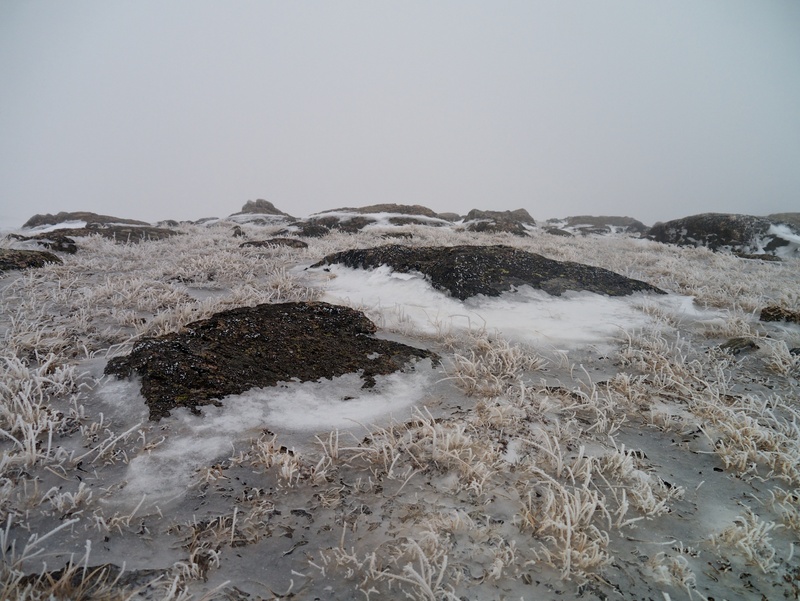 As we climbed above 11,000 feet the visibility became worse and worse. We had to check navigation often to make sure we were headed for lake Dorthy. 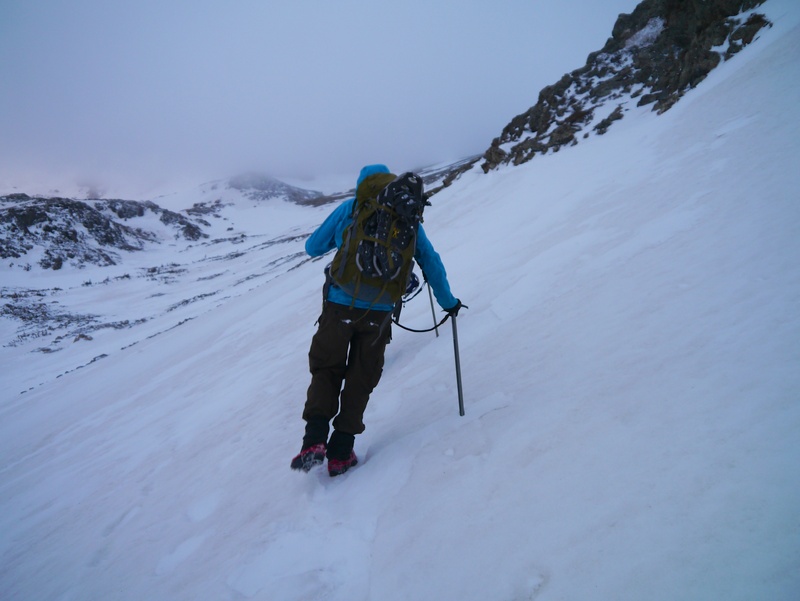 We slowly picked our way towards the base of the couloir. We had to rely solely on a GPS route I had drawn in google earth. 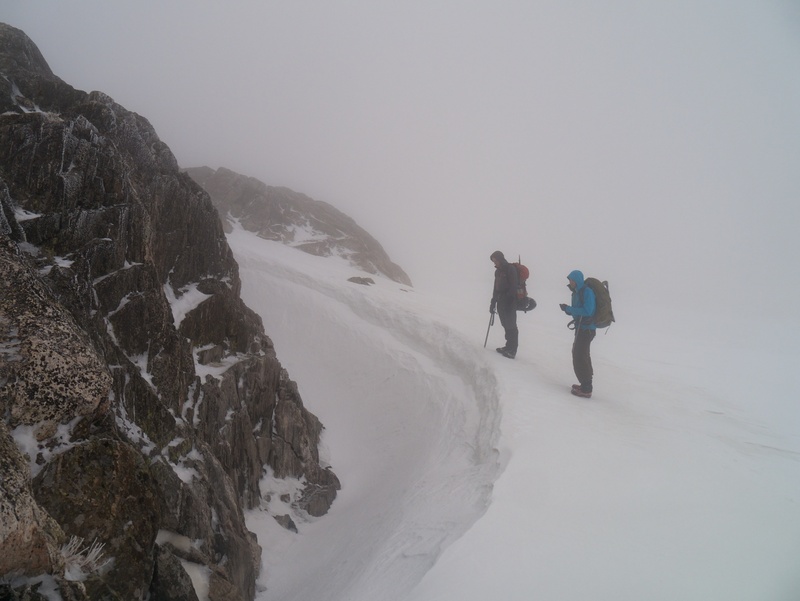 We were unable to see the mountain at all to pick the correct couloir. Rhyme ice (frozen fog) was covering everything. 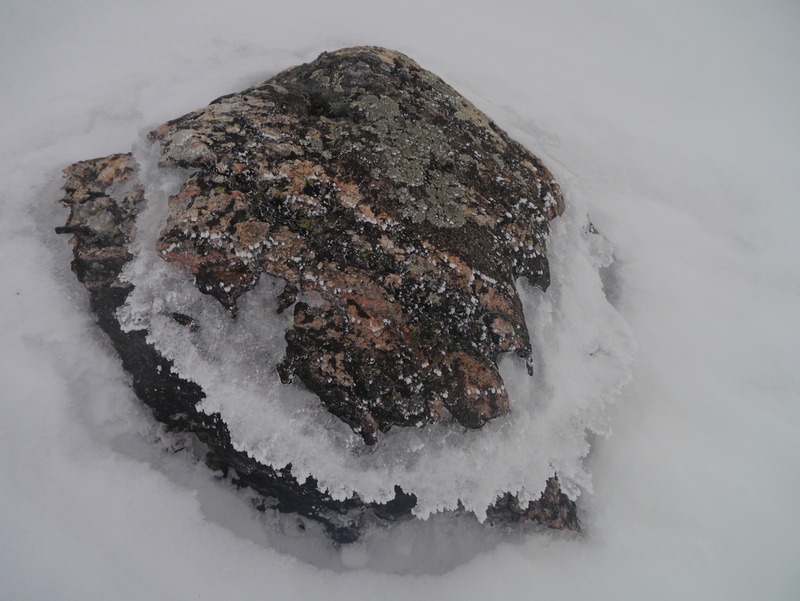 our packs were frozen solid, and our ice axes were slipper from the ice. It also made any rock crossings tenuous. We arrived at what we believed was the base of Juliet we couldn’t even see what the conditions were like 20 feet up the couloir. 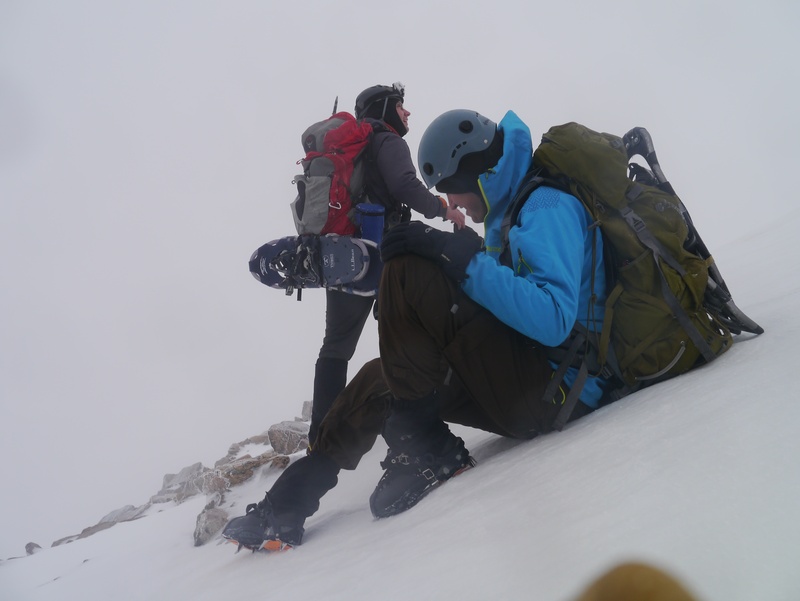 After some discussion, and careful consideration we decided to put on our crampons, and climb a little higher to evaluate. 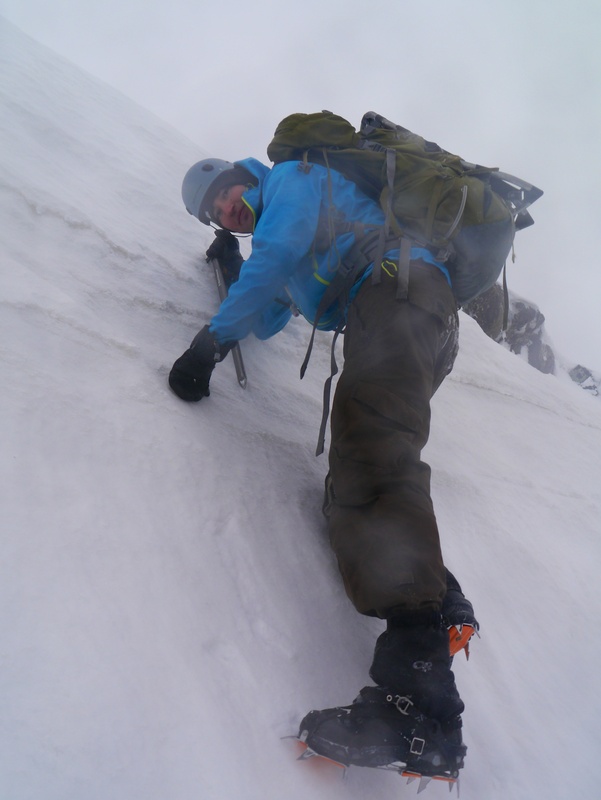 Our plan was to only climb what we felt comfortable reversing in the current conditions. 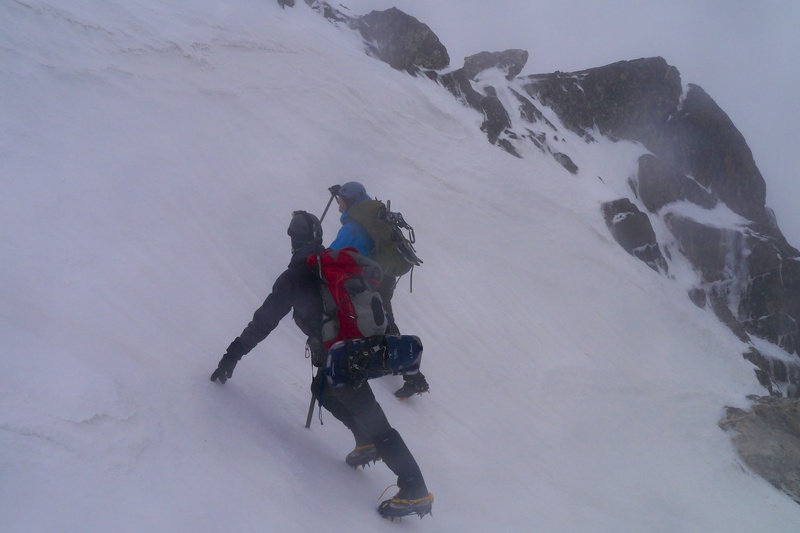 As we climbed higher up in the couloir we began to encounter areas of wind loaded powder. This combined with the fact that we could not evaluate conditions higher up concerned us. 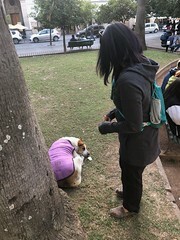 We found a safe spot to sit down and decide whether to proceed. We all agreed that the smart thing to do was call it a day. We put our tail between our legs and began the long retreat back to the cars. Despite our defeat we managed to remain in good spirits. We stopped to talk to several groups headed for Skywalker. 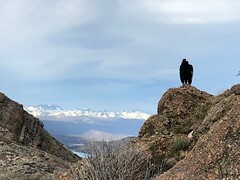 One of the parties was the author of the Summit Post route (linked at top of blog). 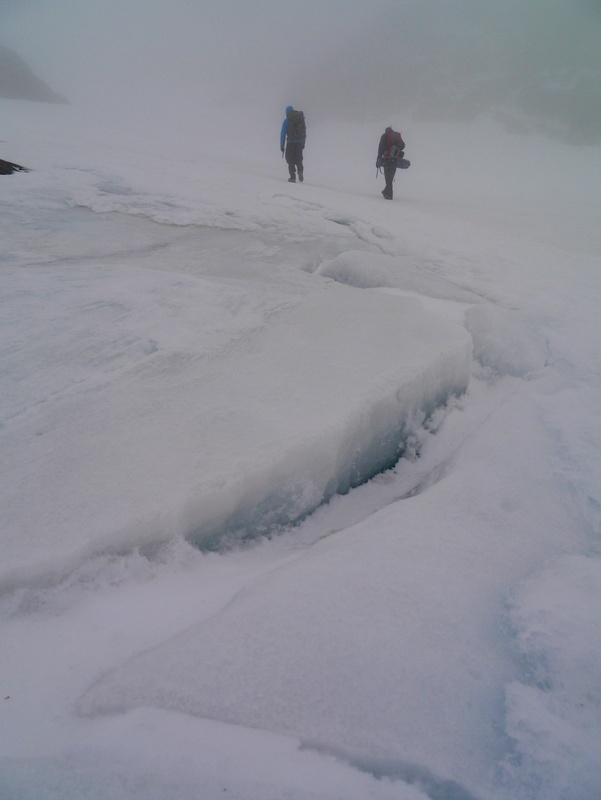 She told us how she had gashed her arm with her ice axe descending from juliet last year. Motivated by the promise of 10AM BBQ in Nederalnd we made good time on the hike out. All in all it was a fun day. Hoefully I will return for this prize another time. 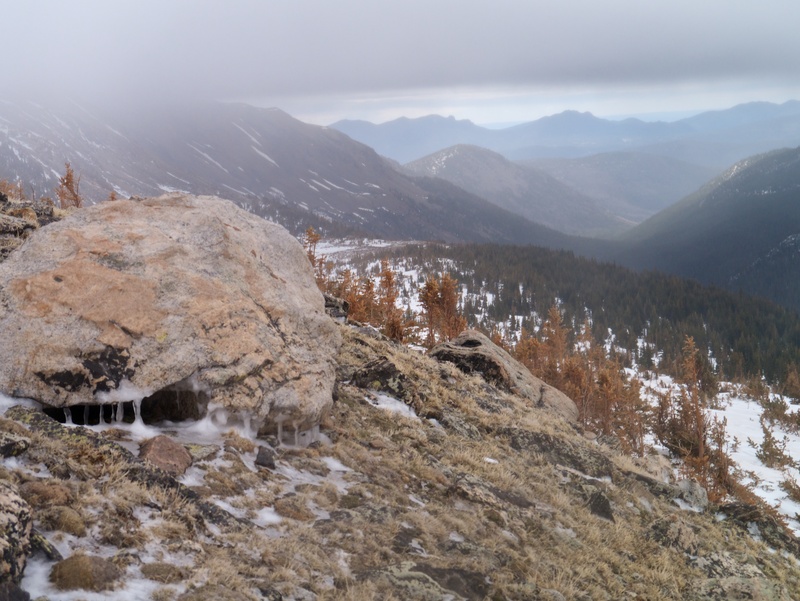 This entry was posted in Hiking, Mountaineering, Uncategorized and tagged climbing, colorado, snow climb. Bookmark the permalink.